I used some left-over sock yarn. This is version one - the pattern is being refined, and I'm going to cast-on another one later on. It will be for the Monkey belonging to my sister and her BF. He emailed me a link to someone selling handmade Monkey jumpers on ebay. He is totally knit-worthy as he fixes my computer on a regular basis - I'm very good at breaking it! Thank you all very much for the lovely comments about my skirt. I wore it to work and everybody thought it was lovely. I'm going to make the white one in the middle (but without the frilly bit) with this material. Which means I'll have to go into The Spinning Wheel for a zip and some interfacing, and as I mentioned in my last post that they're now selling yarn, I'll have to get some of that too. 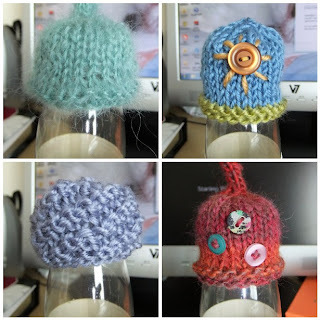 Here are my next four Innocent Smoothie Hats. Thank you to the Phoenix Forum for the inspiration on the buttons. I love how your Damson worked out - gorgeous colours! Monkey looks great in his jumper - you do realise that he'll want lots more knitted things now!! 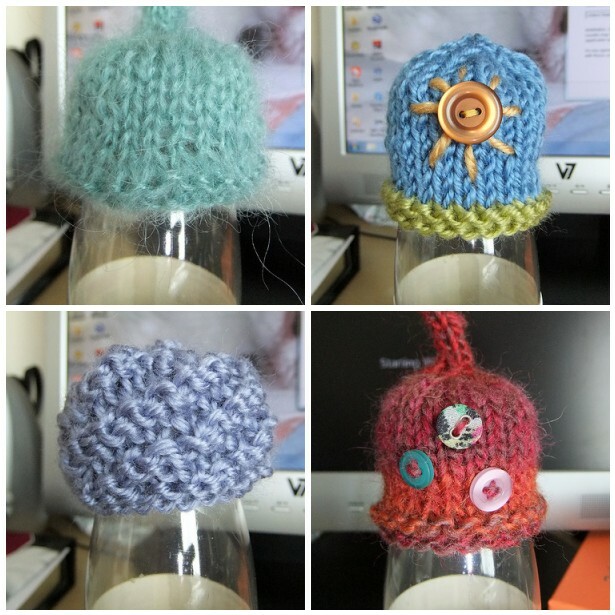 I'm planning on using some buttons in my next lot of Innocent Snoothie hats too - they look more interesting! Have a good week!